BullGuard is a Danish company specializing in security solutions and has been providing antivirus solutions for quite a long time. Here is a complete review of their varied products and services based on different features. There is an abundance of malicious threats on the Internet that can compromise the security of a computer system. Having a powerful security product is important to safeguard your computer. 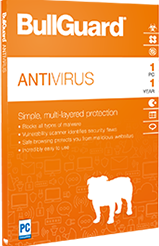 BullGuard Antivirus offers an extensive list of features. The safe browsing feature safeguards your system against malicious websites. Installing the antivirus on your system requires 850mb of the hard drive and 1GB RAM. The installation takes around 10 minutes, which can be considered as quite a bit when compared with other antivirus systems. However, the installation process does not slow down the PC. As for the interface, BullGuard offers a light window and all the protection features are check-marked in green at the right top corner of each active module. If you have a basic version of the antivirus, then two out of the nine active modules would appear active. The rest would be greyed out, prompting you to upgrade to a higher version. It lets you adjust antivirus, spam filters, and most of the advanced features from the toolbar at the left of the screen. – BullGuard offers three types of Antivirus software, BullGuard Antivirus, which is the basic package, Internet Security, which is the intermediate package, and BullGuard Premium Protection, which offers complete protection. Let us have a look at these packages individually. – The basic package of BullGuard Antivirus provides features such as antivirus, anti-phishing, anti-malware, anti-ransomware, behavioral engine (heuristic scanner), safe browsing, vulnerability scanner, and game booster. It is interesting to see that being a basic package, it offers a range of features. The drawback here, however, is that it offers protection only for systems with Windows platform. This variant of BullGuard is currently priced around $24 per year and is a single license software. It also offers a 15-day trial period. – BullGuard Internet Security is the intermediate antivirus that offers features mentioned in the basic package and other features such as firewall, parental control, cloud integrated, and PC tune up. The Internet Security provides protection for Windows, Android, and macOS. It provides a multi-device license for $30 approximately per year. BullGuard Internet Security offers a 60-day trial. – BullGuard Premium Protection is a combination of both, basic and Internet Security package, and it provides additional features such as Home Network Scanner and Identity Protection. The premium protection provides security for Windows, Android, and macOS. The premium protection is offered as a multi-license software at a price of $40 approximately. BullGuard Premium Protection offers a 30-day trial period. All the three variants offer free automatic updates and free 24/7 updates. – BullGuard Antivirus offers an extensive list of features. The safe browsing feature safeguards your system against malicious websites. The websites that you find on search engines are all authenticated by this feature and have a green checkmark on them if they are safe. When an infected website is detected, the you would be prompted about the same and advertised to leave the website. – BullGuard Antivirus advertises its malware blocking as one of its best features. The feature removes malicious software quickly as it encounters it in the system and on the Internet. An interesting feature about their antivirus protection is that it offers various levels of protection. It lets you scan for incoming traffic and all the received emails. It also has a heuristic analysis that keeps a track of questionable software by sending commands analyzing their behavior. – The anti-phishing is effective, but the drawback here is that you need to activate the feature every time you are visiting a website. It also offers a spam filter that blocks emails with low credibility and questionable content. However, it only works with selected web browsers. It also allows you to manually block all the spam contacts and can be used for the entire domain. This is because the spammers change their email address so that they can send the users new emails through that address. – One of the key features offered by BullGuard antivirus is the Backup Module. Although available only in its latest module, it lets you upload encrypted files from the BullGuard cloud directly to the main cloud platforms. This is a useful option if you want to keep your important data safe and backed up in another location. – The vulnerability scanner does not provide anything different from any other antivirus software. You are advised to update your operating system and drivers before scanning for new vulnerabilities. – BullGuard is one of the best antiviruses if you are looking for anything that is not too detailed or complex. You can always opt for a trial version of the software to get firsthand experience before deciding to buy the full package. Visit the official website of BullGuard to know more about their latest offers and updates.